Do you really want to embrace the Code, or are you just trying to piss off your old man? "Hello. My name is Sophie Louie Winter. You ganked my father..."
Actually, they don't have the death penalty in the UK. But we certainly do in highsec. Ah, another one of those "I'm not really a miner, I was just experimenting" types. What is it with miners and bathrooms? People wonder why we have a New Order Bathroom Protocol, but trust me, it's essential. New Order democracy is much more efficient than the other versions. No wasted votes. ...Besides, the people love me. All the good people, that is. If you're thinking about starting EVE for the first time, don't bother with Steam reviews or articles written by video game "journalists". Ask an Agent if EVE is right for you. Better yet, read the Code. If you don't approve, find another game. "A moral monster all returns." I think this is the guy who writes those weird episode titles that some shows have. It's a good thing the Code doesn't make miners salty. Ray Dawnsblood didn't approve of an earlier MinerBumping post. Ray, there's a reason why people read MinerBumping.com and not MinersTellTheirSideoftheStory.com. Formatting! Viljar VVarde came up with a brilliant revenge plot: Put a bounty on the Agent who ganked him, and then try to collect that same bounty. A simpler plan would've been for Viljar not to spend his money on bounties in the first place. And I suspect it would've resulted in the same number of killmails. As the old proverb states, "When a miner seeks to bathe in the misery pig vomit of a ganker, the only misery pig vomit he'll bathe in is his own." You see? A compliant miner is a happy miner. That miner haiku is beautiful! Nothing miner related is beautiful. Let you in life as well throw the karma sir. a moral monster all returns. Reading this makes the Code shine brighter in my heart. Beauty can emerge from the stinkiest cesspools. That doesn't justify their existence of course. Yet, I feel sorry for the agent who can't enjoy tears, moaning, death or awe, just for it originates from a miner. Those sound like the qualities of a sociopath. That miner SoulLancer was great. I found him, an 11 year old killboard virgin, in a Mackinaw belt ratting and looting the wrecks. Didn't even have his lasers on. I killed him and ascendancy pod which sent him back to a station in the same system. 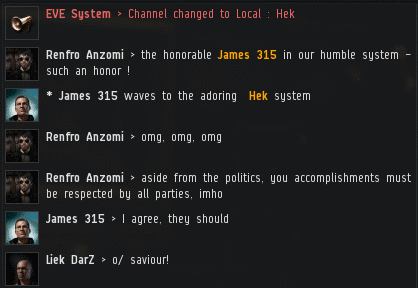 He smacked a billion ISK bounty on me, but then a couple hours later he sent me that nice mail and became the perfect Gallant. 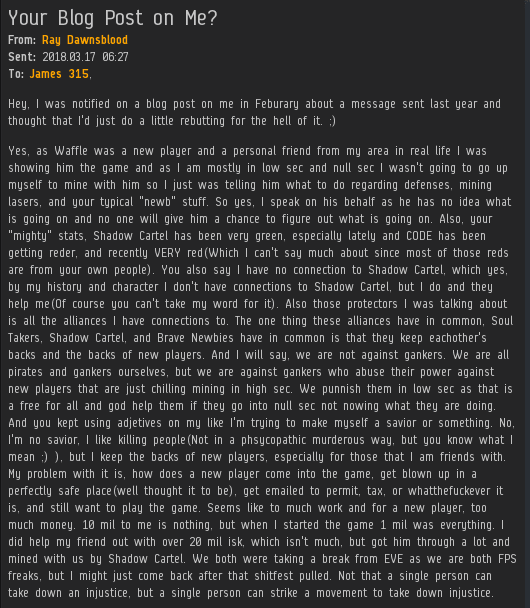 Turns out he had taken a 10 year break and was totally unfamiliar with current mechanics and the state of Highsec. I loled, now I gotta watch the movie again. Hey Ray, you are a shitter. You don't belong in EVE if you can't separate the Game fron RL. 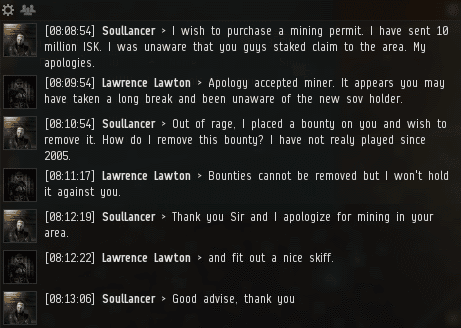 Every excuse you make is invalid because you are a carebear miner, and carebear miners don't have opinions in EVE, you are only here for real players to shoot at. Why are you so butthurt over a retriever loss, Raymond? Don't wait a month to reply, idiot. No one here has that kind of attention span. Get your permit rayray, or get rekt. You speak like a miner. Such foul language. Lol Ray is an idiot, and so are his friends. And all the little children! You might say he is a child lover. You might say it in Greek even. Although Kadipa Cthulu was out shadowed by others in this article I think they deserve the highlight, a prime example of a theme-parker. These kinds of people are the ones that pose the largest threat to Eve.